The sign on the boulder gives the height of the mountain as 3,553 feet (which is 1,083 metres) above sea-level. Charlie and Diane Winger’s book, Highpoint Adventures, gives the height as 3,560 feet / 1,085 metres, while the ‘summitpost’ website says it’s 3,533 feet / 1,077 metres. 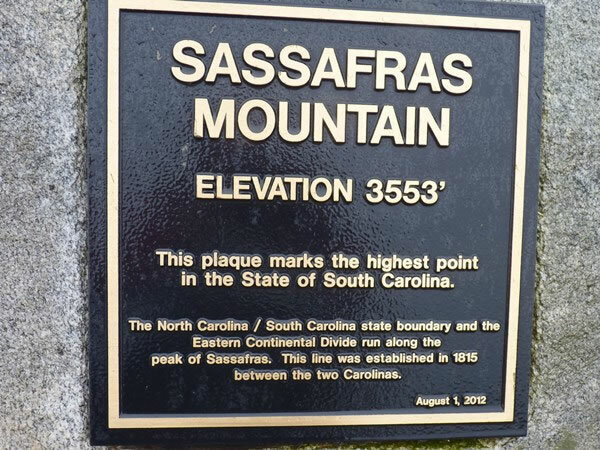 I’m relieved to say that no matter which of these figures is correct, Sassafras Mountain is still the highest mountain in South Carolina. In addition, even the lowest of these figures is still higher than the height of White Butte, North Dakota, so Sassafras Mountain remains the 29th highest US state highpoint.